Everyone loves a fantastic finish and we feel as though NFL Films and such focus too much on the glamour teams. They leave too many great moments on the cutting room floor if it’s not Dallas, Pittsburgh, or Green Bay. What if we were to tell you that a team actually completed a hook and lateral (not ladder) and a hail mary to finish a game?? Yes everyone remembers the hook and lateral in the ’81 AFC Divisional Playoff between San Diego and Miami, yet we’re going to take you to one that was even better. It was the last great moment in the 21 years Metropolitan Stadium served the Minnesota Vikings. It was 1980 and the ink was just drying on the Nation’s newspapers of Ronald Reagan’s landslide victory over incumbent President Jimmy Carter. The Iran hostage situation was over 400 days old and we were completing the 1980 NFL Season. Teams were just now fully understanding the capabilities afforded them when the NFL loosened it’s rules on passing before the 1978 season. The ball was able to be thrown and touch multiple receivers without having to hit a defender in the interim giving birth to the Hail Mary. The Minnesota Vikings had just said goodbye to Hall of Fame QB Fran Tarkenton, the league’s All Time yardage and touchdown passing leader. In stepped Tommy Kramer, who had none of the big game moxie of a Tarkenton. He was a poor man’s Danny White in that he followed the most revered quarterback in the team’s history. After losing the fourth game to the 4-0 Detroit Lions, 27-20, it looked as though the Vikings had indeed passed the baton. However with a strong finishing kick they went into the penultimate game of the season with an 8-6 record. If they could win the 15th game, they would win Bud Grant his 11th NFC Central Division Tltle. Their opponent going into that game was no slouch. In came the 10-4 Cleveland Browns and Sam Rutigliano. He was in his third year and on his way to his second straight NFL Coach of the Year award for breathing life into a moribund franchise. In those years they were known for their ability to win a game in the final seconds and had performed that feat 14 times in the last two years with less than 2 minutes remaining in the game. Moreover this was the Browns first real winning season in nearly 10 years. What better chance to show that they had arrived than to go on the road and win in a tough NFC camp and finish off the Viking’s season. So on a cold day the Browns took the field and roared to a 23-9 lead and the Vikings looked cold on their sideline as the 3rd quarter ended. Then the Browns started playing conservatively and played close to the vest as the Vikings roared back. Epilogue: The Vikings running a hook and lateral on the opposite of the three receivers look on a Hail Mary was beautiful and I can’t remember anyone running it like that since. By the way, do you know who the Cleveland Browns linebacker #53, who was beaten on the play was?? Try former Pittsburgh Steeler Coach Bill Cowher. Yet this team covered 80 yards in 2 plays to earn Hall of Fame coach Bud Grant his 11th and final NFC Central Division title. However they went down to the eventual NFC Champion Philadelphia Eagles in the ’80 NFC Divisional round of the playoffs 31-16. Mike Davis intercepts Brian Sipe’s pass for Ozzie Newsome to end the Brown’s season 14-12, in the 1980 playoffs. On that exact same weekend the “Cardiac Kids” Cleveland Browns lost in the ’80 AFC Divisional Round to the Oakland Raiders 14-12. This game was made famous for “Red Right 88”. The tail end of a play’s assignment that had the Browns throw to the tight end in -42* weather rather than kick the obvious field goal. It was 3rd down and Coach Rutigliano opted to go for the endzone one more time. Only to have Raider Safety Mike Davis step in for a game clinching interception to end the Browns season. 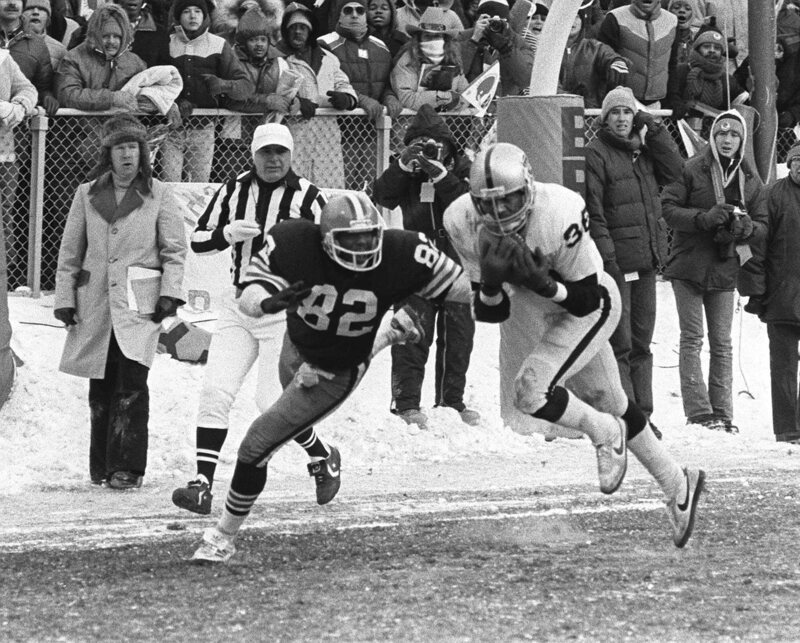 However the Browns had two kicks blocked in that game which was one of the coldest in NFL history. However for one magnificent drive, Tommy Kramer, Ted Brown, and Ahmad Rashad gave Viking fans the last great moment in Metropolitan Stadium. Within 2 years they would move indoors and the Viking franchise hasn’t been the same since. Hopefully they can get a new stadium deal and go back outside where the Vikings should be.